My father and I started working on our stone engraving company in 2009. It has been quite a journey for the both of us! My dad worked for about 35 years as a brick/stone mason and recently retired from it. He has always been a hard worker and wasn't "really" ready to stop working. Stone engraving was a natural fit for him based on his lifetime career so he starting doing some research. 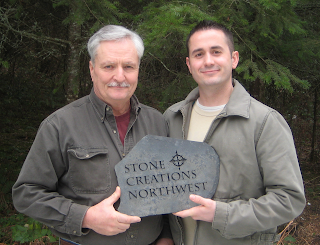 He came to me with some ideas and asked me if I would be interested in starting a stone engraving business with him. I thought that this was a very interesting and unique idea and I couldn't say no. We purchased a graphic design program and I began the long process of learning it! We decided that we would not attempt to sell a single engraved stone until we had the highest quality product available. We feel that our hard work and attention to detail is what sets us apart from anyone else in the field of stone engraving. Look through our gallery on our website and you will see the difference for yourself. We have been blown away by the response we have received from our customers. We are proud to provide such meaningful and personal artwork that touches peoples hearts and last a lifetime!